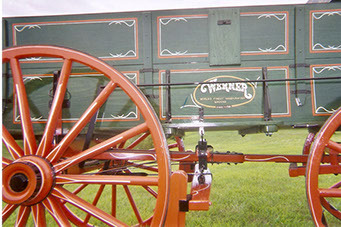 If you are looking to purchase a wagon, Werner Wagon Works has been building new and restoring horse drawn vehicles since 1988. We build and restore a wide variety of horse drawn vehicles some of these include; Covered Wagons, Box Wagons, Chuck Wagons, Buckboard Wagon, Prairie Schooner, Wagonettes, Stagecoaches, and many more. We will custom build covered wagons to your spec. Don Werner is one of the best wainwrights and wheelwrights in the industry and will build you the wagon you have always dreamed of. We do tours of our wagon shop for groups small or large! In visiting Werner Wagon Works you will learn the why’s and how’s of building a horse drawn vehicle. You will also learn the history of our great country and the movement west. If you love history and want to take a guided tour and visit our shop please call for an appointment time. Hope to see along the trail!